Kitchen & Bath Remodeling - The Portfolio Group, Inc. Kitchen and bath design are among the most challenging aspects of interior design. For the homeowner, the choice of cabinets, countertops, backsplashes, flooring, appliances, plumbing fixtures, etc. can be daunting and bewildering. The images above are an example of a kitchen replacement currently in progress. These images are computer-generated, intended to help in the planning process of such remodeling projects. The top row of “thumbnails” are views (similar to elevations) of this kitchen project constructed in 3D modeling software. Once modeled, these views can be zoomed in/out and looked at from different angles. Additionally, different materials, colors, etc. can be changed and explored dynamically. 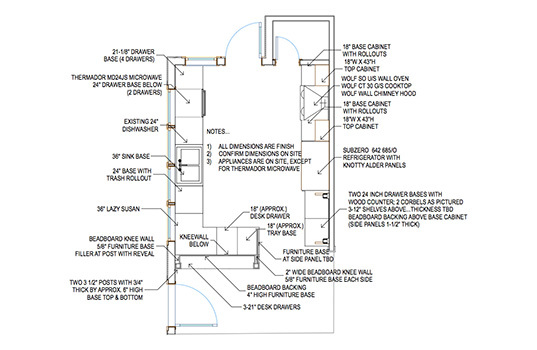 All of this functionality aids in visualizing the proposed kitchen or bath project. The bottom row of “thumbnails” illustrates a static, more “photorealistic” picture of each of the 3D models in the row above, hopefully an additional enhanced visualization of the proposed project.